Preheat oven to 450° F. In a small mixing bowl, combine softened cream cheese, sour cream, 1 cup of the shredded cheese, soup mix and drained spinach. Transfer the mixture to a 9" glass pie pan and top with the remaining 1 cup of shredded cheese and the crumbled bacon. Put the dip and the pizza crusts into the oven for 8 – 10 minutes until the dip is bubbly and the crusts are golden brown. Cut the crusts into 1" strips. 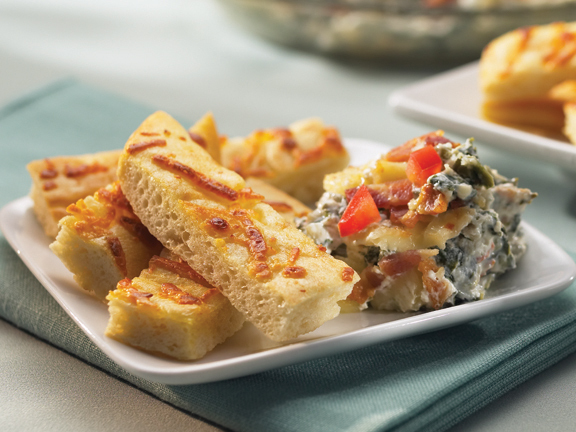 Top the warm dip with the diced tomato and serve alongside crusts.